SLIDELL, La. — Two weeks after Hurricane Katrina, two old friends went searching for keepsakes in the ruins of their childhood church, Our Lady of Lourdes. Lisa Aldridge dug through the shorn ceiling beams and tree branches out back. “There’s a statue down here!” she called out, and stood, cradling a pumpkin-size, decapitated wooden head in her arms. There was a deep slice through the crown of thorns and a missing lock of hair. The head’s left side was coated in oily mud, which Lisa’s brother, Philip, tried to hose off. The women found the statue’s pinkie, which Mrs. Jochem later set on a shelf in her Stuart, Fla., home. Ms. Aldridge’s childhood home near the church was destroyed by the storm, so she strapped the head into her car’s passenger seat and drove to her sister’s house in Tallahassee. The rest of the statue was still bolted to the cross, perched on the last slab of roof left when the cathedral ceiling collapsed, awaiting its own rescue. 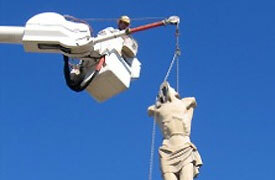 The Gulf Coast is awash with church-less and sometimes headless statues. Wooden and ceramic images of Jesus, Mary and Joseph have turned up in water, under ceilings and crumbling walls, and on train tracks miles from an altar. return them someday to rebuilt churches. To those who lost everything, custody of a saintly image can be a source of comfort. Family milestones are intertwined with parish life and finding a religious relic is akin to recovering the past. Catholic saints have an unusually powerful presence in the New Orleans region, where back-road lawn shrines cocoon casts of Jesus’ mother. Catholic traditions brought by the French and Spanish and adopted by Haitians and Africans blended into popular culture. On St. Joseph’s Day, March 19, revelers visit strangers’ homes to see hand-built altars festooned with the saint’s likeness. Hope nestles in the smallest fragments. Parishioners of St. Thomas the Apostle in Long Beach, Miss., unearthed from the wreckage the hands and forearm of a crucifix. “If you find something, at least you can take that something into your future,” says Paula Spears, the liturgy director at St. Thomas, who is safeguarding the items. Scavenging one day in Bay St. Louis, Miss., Caleb Kergosien, 12, spied a 3-foot carved figure of Christ in a Water Oak tree. It turned out to be from St. Joseph’s chapel of Our Lady of the Gulf, where his parents had married 15 years ago. The statue hung in the family’s government-supplied trailer for a week, watching over meals and homework time. “The truth is, that week, they were a little better behaved,” says the boy’s father, Geoff Kergosien, who has since moved the figure to storage with the family’s other possessions. Homeless from the storm, Mrs. Daigle stored two statues in her daughter’s closet and left the St. Anthony with former Slidell Mayor Sam Caruso. Father Adrian Hall, the priest at Our Lady of Lourdes, praised the “devotion” of his parishioners for rescuing the statues and other pieces. The church is keeping a record of who has what. Mr. Caruso, a former seminarian, has long collected items discarded by churches — including the marble altar railing where he knelt for his First Communion, which serves as the base of his dinner table. The mud-freckled St. Anthony now leans against the Caruso home, overlooking wooden pilgrims on the lawn. His daughter-in-law, Anna, prayed to St. Anthony, the patron saint of lost things, when part of the garage door went missing. She found it. Last month, the body of the crucifix from Our Lady of Lourdes rose from the splinters of the church. Its spindly limbs, bleached white by the sun, twisted from the jib of a power company truck before the linesmen tucked it into a woodworker’s van. “I’m not real religious, but he’s Jesus and he needs help,” says John Schott, 40, the woodworker and former altar boy who volunteered to make repairs. The carved statue — 10 foot 6 inches “with thorns,” Mr. Schott says — is in his furniture repair shop now. He plans to disinfect the wood, which is probably pine, fill the cracks with glue and resin, then stain it. The crucifix, brought from Italy more than 40 years ago, will be stored until the church is rebuilt. He will also need to reattach the head, which he has yet to see. Mr. Schott’s hardest task was removing Christ from the cross. Because it was too unwieldy to lower the entire crucifix, Mr. Schott lay on a sliver of church rooftop strewn with broken glass and sawed at the bolts connecting the body to the cross. Then he examined the nails and recalled a childhood wish to remove Jesus’ pain. “Being a Christian, I wanted to get the nails out of his hands and feet,” Mr. Schott said. The wood shrank as it dried. After a couple of weeks, Mr. Schott tugged. The nails slipped out easily.